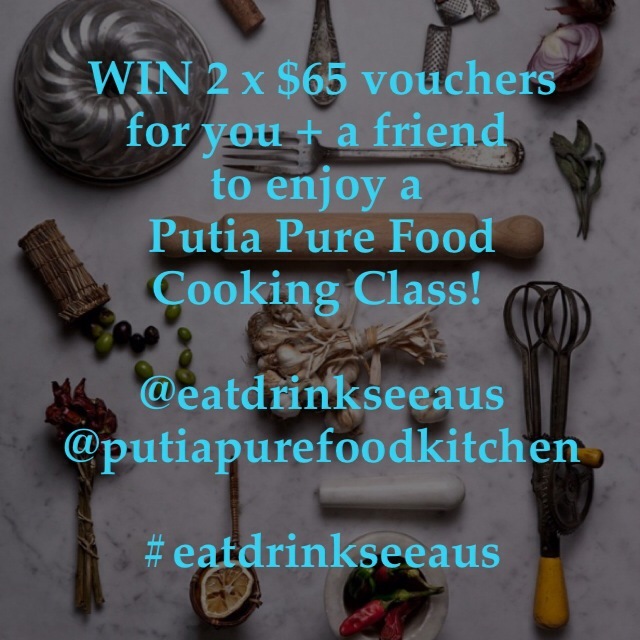 WIN 2 x $65 vouchers for you and a friend to enjoy a Putia Pure Food Cooking Class! Vouchers valid until 31 May 2015. HOW TO ENTER: 1. Follow @eatdrinkseeaus + @putiapurefoodkitchen on Instagram 2. Repost the below photo and tag both pages and hashtag #eatdrinkseeaus OR Tag 3 friends in the post on the @eatdrinkseeaus Instagram page ABOUT PUTIA PURE FOOD COOKING CLASSES: Chef Dominique Rizzo aims to inspire and connect with people wanting to eat, cook, learn and enjoy pure foods. There are a variety of classes on offer such as Indian, Lebanese, Moroccan, Italian, Vietnamese and Spanish cuisines and on topics such as Jam making, Herbal teas, Paleo, Raw food, Seafood, Craft Beer tasting and Wine and food matching. The full schedule of the classes can be seen at http://www.putiapurefood.com.au/school/ TERMS + CONDITIONS: Competition closes Saturday 28 February 2015. Entrants must be following @eatdrinkseeaus + @putiapurefoodkitchen and must either repost the image or tag 3 friends in the post on @eatdrinkseeaus to be in the competition. Entry is unlimited and you can enter the competition as many times as you like. All entrants names will be printed on a piece of paper and the winner will be drawn out of a hat with the winner being announced on Monday 2nd March.